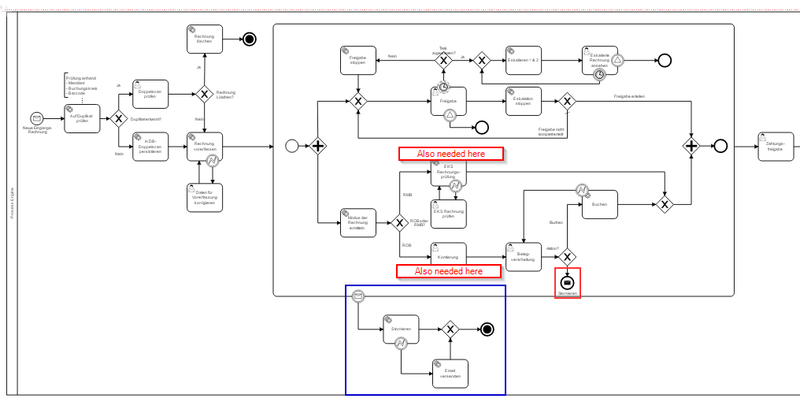 we’ve got a BPMN-Model which need to be terminated on several conditions. The red message-end events throw a message called “erwCancelInvoice” and the blue message-start event in subprocess is catching this message. If I test the new model, the subprocess is never startet. Seems that the message-throwing/-catching not working in this szenario. I think there is something wrong within my model? sending the message inside one process is a little problematic, it is not recommended and it is a little tricky to do. Can you please post your code for the message correlation that is used at the message end event? It’s the first time I try modelling with messages … there is no explicit implementation for the message correlation (thought this is done automatically, cause the message to throw is configured in the modeller). Do I always need an explicit implementation? PS: Cause of your feedback about message-sending in the same process I now try another way and will post it here for discussion. Still thinking about the process, I created another model using message-boundary. Is this way to handle with message in same process a better way to solve my problem? I wouldn’t model this situation with a message event (because you are actually not sending messages). You just want to check at several points if a condition is true, and if this is the case you want to start a subprocess. So I would suggest you use a conditional event instead of a message event. You can read about it here. This events represents your use case a bit better. 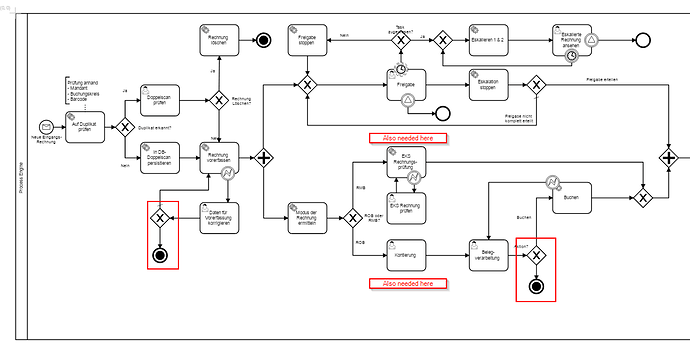 So set a condition as a process variable in your subprocess if you want to trigger the subprocess or not and add a conditional boundary event to the subprocess. At this, I found the cancel-boundary event - which sounds like it fits to my requirements, cause I must cancel the subprocess and after doing that, I must cancel the parent-process. I’l give it a try and will publish a new model here. after “studying” the BPMN-documentations, I found an interesting way with transactions and compensations … this sounds like the solution for me. 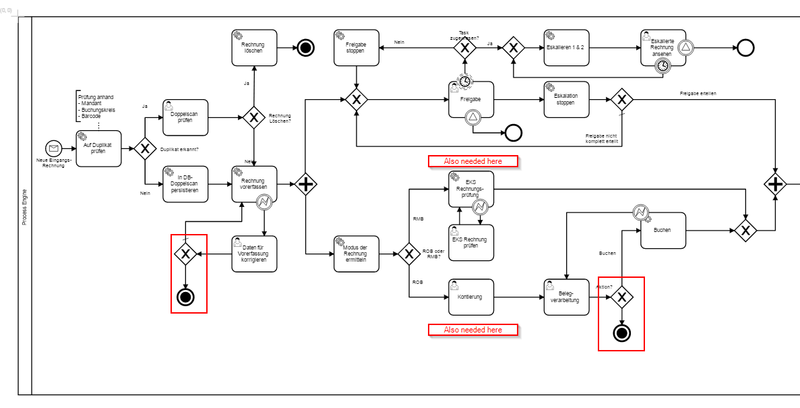 Can you please take a look at the following model - is this valid with the transaction-cancel and then stop the hole process after sub-process has done it’s compensations?